We are continuing the series by our contributing writer (future transportation technologies) Paul Schilperoord, whose book "Future Tech - Innovations in Transportation" was published in 2006 by Octopus Design / Black Dog Publishing. 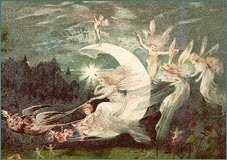 Here are a few examples from this book, as well as some material not found in the book, provided exclusively for DRB. 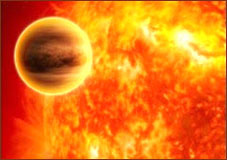 Our sincere hope is that we are going to see at least some of these concepts mass-produced one day. 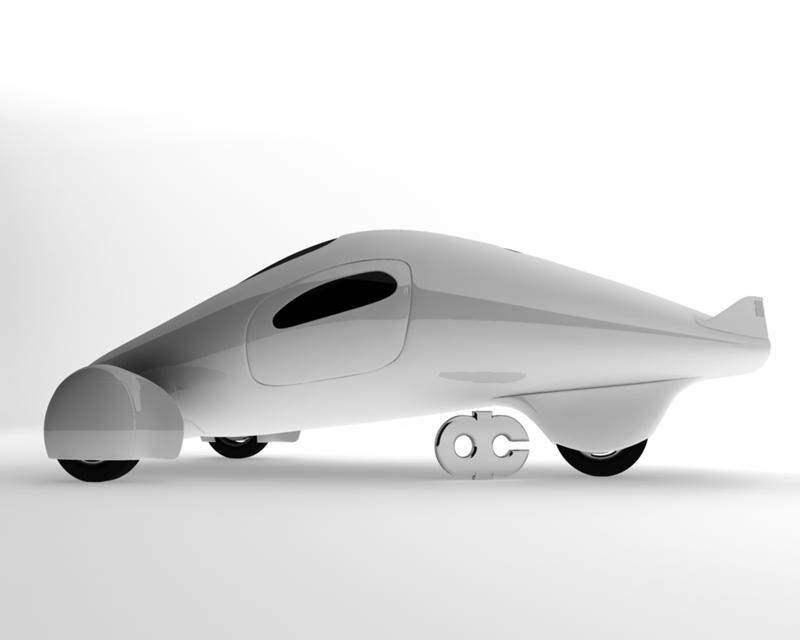 The American company Accelerated Composites aims to keep the design of its Aptera concept car even closer to an aerodynamic ideal shape. The company claims to be able to achieve a drag coefficient of less than 0.06 using a highly unconventional aerodynamic body shape. Combined with a lightweight composite construction, the Aptera should achieve a fuel consumption as low as 0.7 litres per one hundred kilometres (336 mpg US). 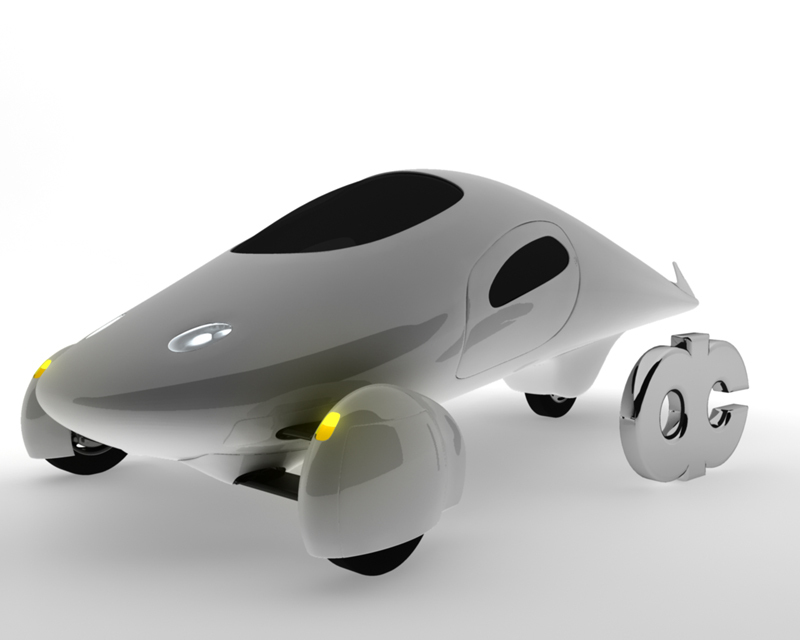 The styling of the Aptera concept car shows more resemblance with airplane than with car design. 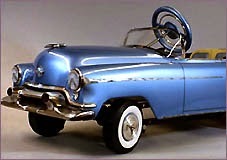 The car has a wide front with two separate front wheels and a tapered rear section with one, fully enclosed rear wheel. Because of the very low drag, the Aptera is equipped with movable fins on the back to create active aerodynamic stabilization at high speeds. The Aptera will be equipped with a parallel hybrid-electric propulsion system. 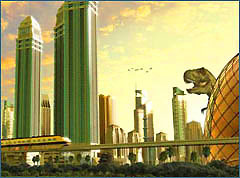 The first prototype of the Aptera is under constructed during 2006. Accelerated Composites is planning production in Southern California, which could start as early as 2008. ACCELERATION 0-97 KM/H (60 MPH): 11 sec. 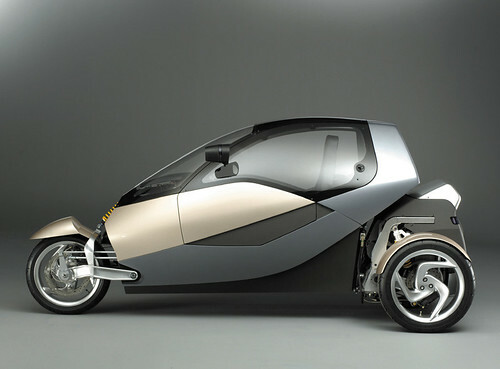 The British company Prodrive envisioned a new concept for a vehicle with an enclosed body and the width of a motorcycle. 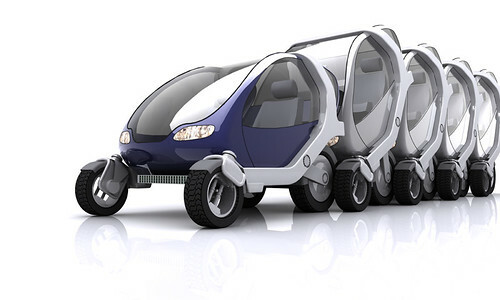 Its concept Naro however has four wheels and works with a tilting mechanism to prevent it from tipping over in curves in the road. 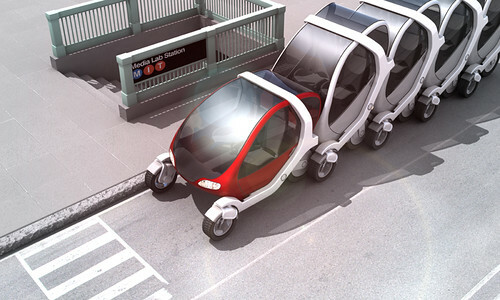 Naro: "NARROW CITY VEHICLE" is a city vehicle designed to diminish the traffic congestion and pollution in urban areas. 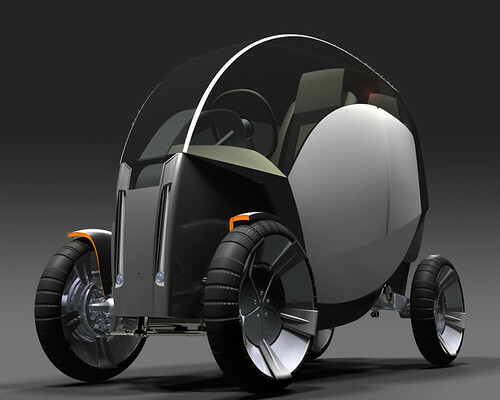 With its narrow body, the four-wheeled Naro is able to drive through traffic congestions much in the same way as a motorcycle. 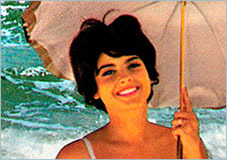 The two passengers sit behind one and another in the fully enclosed body, which offers a passive safety level comparable to a small modern passenger car. The front-positioned driver however sits higher above ground level and therefore has a better view over the road. 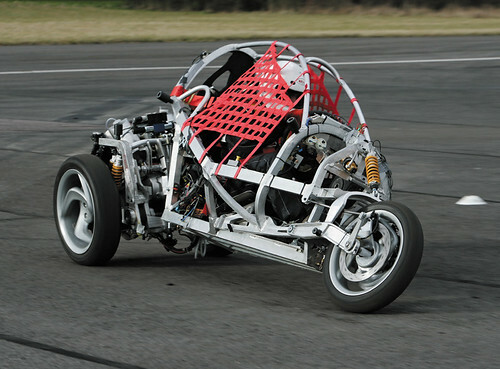 A conventional four-wheeled vehicle with a similar narrow track and high centre of gravity would tend to fall over sideways when turning at high speeds. To avoid this problem, the Naro is equipped with a carving mechanism which makes all four wheels and the body tilt sideways during cornering. The amount of tilt during cornering depends on the driving speed. 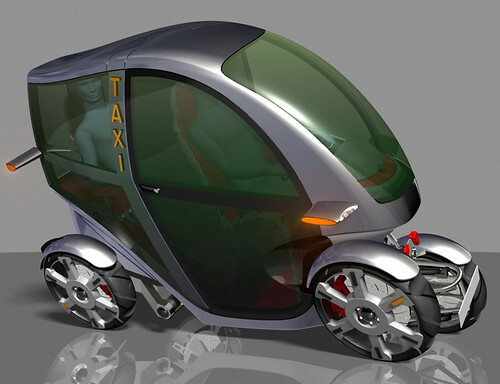 Prodrive envisions various applications for the Naro, including a passenger vehicle, city taxi and delivery vehicle. 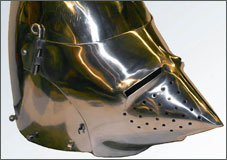 The company has completed a first prototype and is conducting road-tests during 2006. 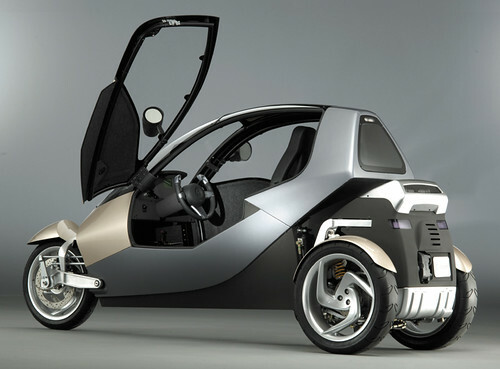 Another enclosed motorcycle concept is in development by a European consortium, on initiative of the Technical University in Berlin, Institute for Motor Vehicles. 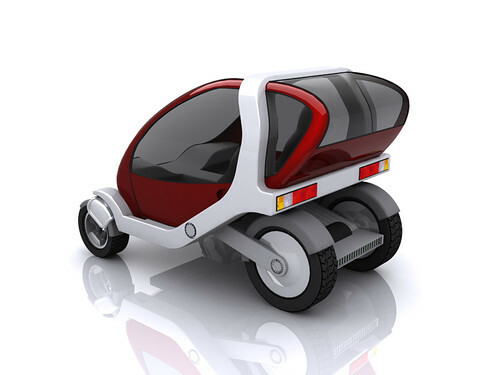 This three-wheeled vehicle, named CLEVER (Compact Low Emission Vehicle for Urban Transport), is designed as a city vehicle for two people, which requires little space, has a low weight, a low fuel consumption and low emissions. 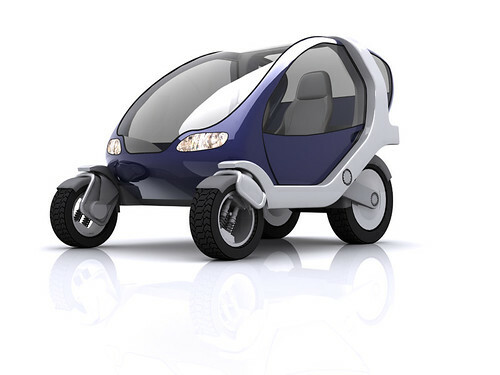 The CLEVER (Compact Low Emission Vehicle for Urban Transport) is a compact city vehicle for two people, which requires little space and has a low weight. In turn, the vehicle requires just a small engine in order to reduce fuel consumption and exhaust emissions. 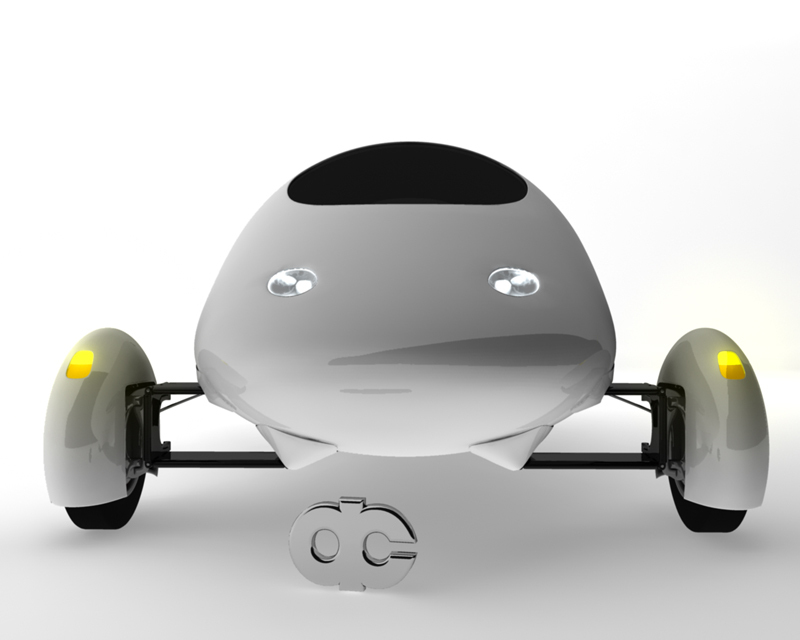 The CLEVER is under development by a European consortium, on initiative of the Technical University in Berlin, Institute for Motor Vehicles. 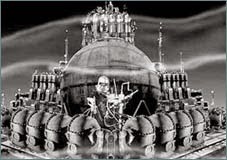 In 2006 a prototype vehicle was built by the University of Bath in Great Britain. The two occupants sit behind one another in the streamlined, narrow cabin. To prevent the danger of tipping over, the cabin of the vehicle is designed to tilt when cornering. The CLEVER is driven by a single-cylinder engine of 230 cc displacement, running on natural gas. ACCELERATION 0 – 60 KM/H (37 MPH): 7.0 sec. 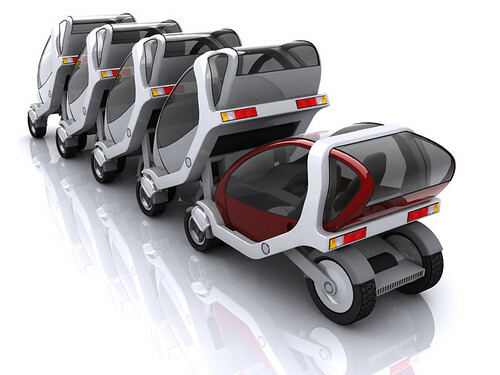 Vehicles such as the Naro and CLEVER could replace conventional cars for daily commuting. But an implementation problem is that most people would still require a full-sized family car to drive in the weekend and on holidays. This means they would need to invest in the purchase and maintenance of two vehicles. To make this a realistic scenario, the commuting vehicle would have to be cheap enough to purchase and offer great savings on fuel consumption in order to replace the family car as the daily driver. Also parking of all these extra vehicles is a very relevant issue. The American MTI Medialab believes a solution could be found in a network of its small electric City Cars, which are available to anyone subscribed to the system. No individuals own such a car. 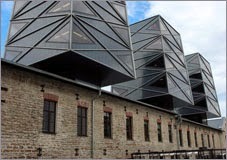 They can be found all over the city, efficiently parked in Vehicle Stacks. The idea is that these small, electric city vehicles are scattered around the city and available to be used by anyone subscribed to the City Car network. This connects existing public transport networks and allows citizens the use of on-demand individualized mobility. Potential users can subscribe to the City Car network in order to obtain a swipe card, with which they can get access to any City Car parked at a Vehicle Stack. These would for example be situated near train stations and stops for metro, bus and tram as well as a number of general sites. After use, the City Car can be returned to the nearest Vehicle Stack. A metropolitan city, or a company operating within the city, can own a fleet of City Cars parked on a large number of sites throughout the city. Also urban condominiums and large corporations could have their own Vehicle Stack, which is little more that an assigned parking area equipped with a recharging unit for a stack of City Cars. 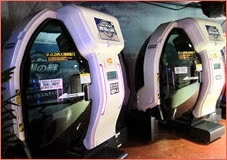 Each Vehicle Stack receives incoming vehicles in-line and re-charges the batteries. Users take the first fully charged vehicle available at the front of the stack. 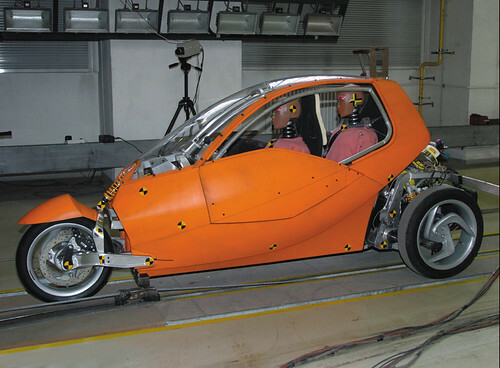 The rear wheel arrangement can collapse underneath the vehicle, which will cause the rear of the vehicle cabin to tilt upwards to allow a second vehicle to be stacked tightly against it, similar to luggage carts at the airport. 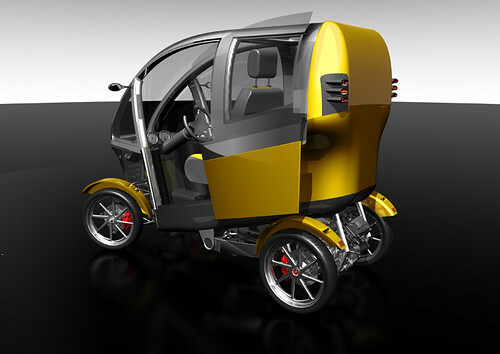 The City Car utilizes electric motors and suspension systems integrated into each wheel hub. These so-called Wheel Robots eliminate the need for a conventional drive train configuration with an engine, gearbox and differential. Each Wheel Robot is self-contained and digitally controlled. Together they provide all-wheel power and steering, capable of 360 degrees freedom of movement. This makes omni-directional movement possible. The City Car is under development by MIT (Massachusetts Institute of Technology) Media Lab in co-operation with General Motors (GM). 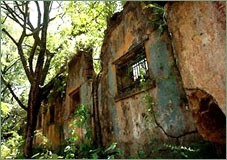 The final aim of the project is to have GM build a fully functioning prototype. 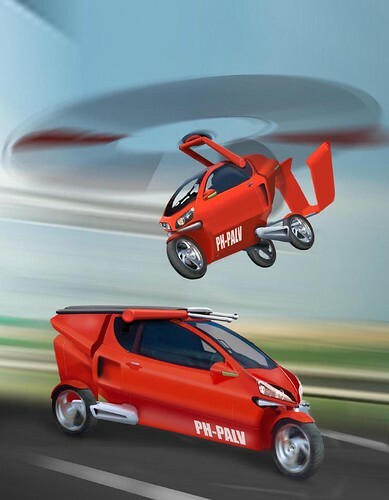 The PALV (Personal Air and Land Vehicle) is a concept for a flying car, which utilizes autogyro flying technology. 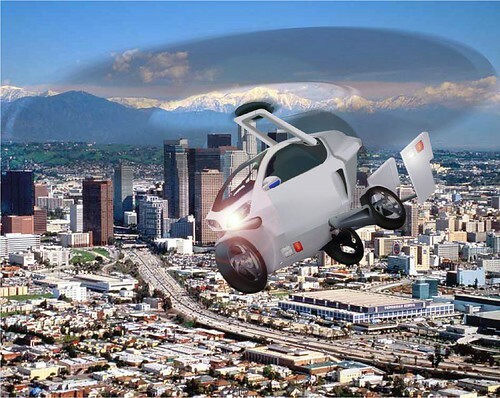 In fact, the PALV is a cross-breed between a car, a motorcycle and a gyrocopter, and is designed to eliminate limitations in either flying or driving mode. 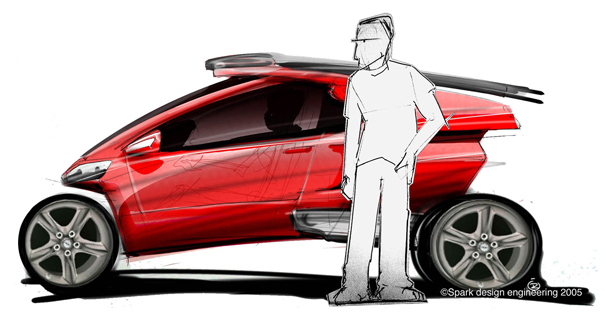 The vehicle is under development by the Dutch entrepreneur John Bakker in close cooperation with the Dutch company Spark Design Engineering and other partners. 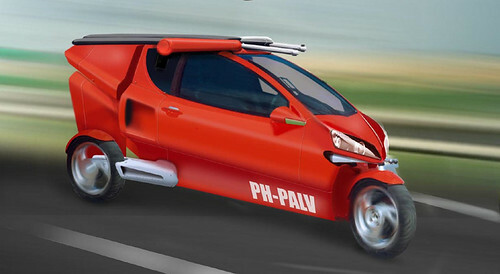 The design of the PALV is based on the three-wheeled road-going production vehicle Carver One from the Dutch company Carver Europe. 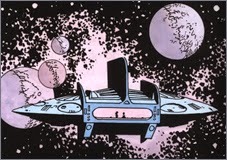 The Carver One has a fully enclosed cabin with two seats placed behind one another. The rear wheels are incorporated into one unit together with the engine and gearbox. The cabin is attached to the rear unit by a mechanical-hydraulic system. The Dynamic Vehicle Control (DVC) automatically tilts the cabin, depending on the steering input, speed and acceleration of the vehicle, much like a motorcycle. 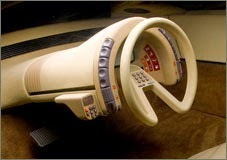 The same system and general cabin layout is used for the PALV. On the road, the PALV can reach speeds of 200 kilometres per hour (125 mph). 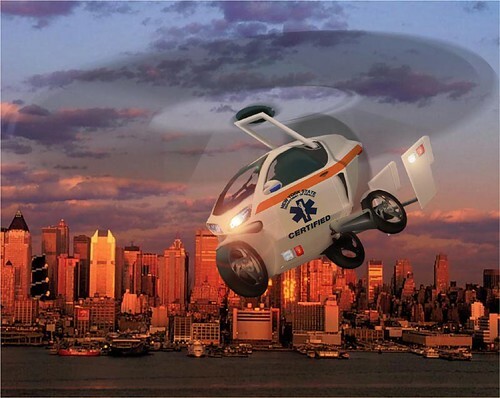 For flying mode, the vehicle is fitted with a single foldable rotor on top of the cabin, a single foldable push propeller at the rear of the cabin and a foldable tail-wing section. 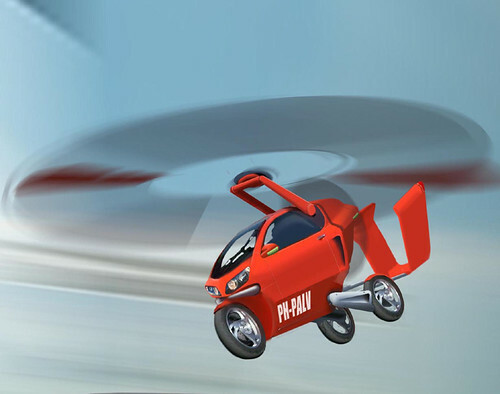 By folding out the rotor blades, propeller and tail-wing section, the PALV is able to take to the skies with autogyro flying technology. Forward speed is produced by the rear propeller, which is driven by the same engine that drives the wheels in road-mode. Within a takeoff run of just 50 metres (165 ft), the PALV is lifted into the air by the foldable rotor on top of the cabin. This rotor auto-rotates due to the forward speed and generates lift. Because of the slower auto-rotation, as well as the absence of a tail rotor, the PALV is much quieter than a helicopter. The PALV is designed to fly under the 1,500 metre (4,000 ft) floor of commercial air space. This makes it possible to take off at any time, without a flight plan, from the nearest airfield or helipad. Much like a helicopter, the PALV has a Very Short Take Off and Vertical Landing (VSTOVL) capability, enabling it to land almost vertically within a distance of just 5 metres (16 ft). The autogyro technology furthermore enables a safe landing even when the engine fails, as the vehicle descends vertically instead of nose-diving. ROAD ACCELERATION 0 – 100 KM/H (60 MPH): 5 sec. It's called CARVER and is already in production, so this is already happening. I wanted to say the very same thing as the guy before me did. It's in production for a while already, it looks awesome. I've seen it around at a Belgian track a few times (Zolder), and in that vicinity it also drove in front of me a few weeks back.